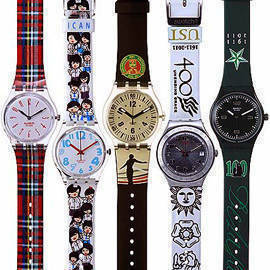 SPOT.ph has spotted proud alumni flaunting their school spirit with these Limited Edition School Watches by Swatch. The UP Watch by Swatch. Click for more photos. Last year, Swatch and the Ateneo de Manila University collaborated to come up with the Ateneo Watch by Swatch in celebration of the university’s 150th anniversary. The proceeds were donated to the 500 at 150 Sesquicentennial Scholarship Campaign, which aimed to send 500 scholars to school at the Ateneo de Manila University. This year, more students, alumni, and supporters have been showing their school pride with more school watches created by Swatch, mostly to benefit worthy causes. The University of the Philippines (UP) Watch by Swatch has the university seal, the Oblation, and the letters "UP" printed on its black silicone watch strap. The De La Salle University (DLSU) Centennial Swatch Collection comes in four designs-the St. La Salle watch with the founder’s signature on the green silicone strap, the 2401 watch with the DLSU façade printed on the white folio plastic strap, the Animo! watch with green stripes on the black silicone strap (also comes with a DLSU laptop bag) and the De La Salle Centennial Chrono with a black leather strap. Proceeds from the sales will go to the One La Salle Scholarship Fund. The University of Sto. Tomas (UST) Quadricentennal Watches by Swatch also has four designs in black and gold, black leather, white leather, and black. The collection marks the university’s Quadricentennial Celebration in 2011. The Assumption College Watch by Swatch is a project of the Assumption College High School Class of 1988 together with the Assumption Alumnae Association. The watch’s folio strap comes in the red plaid pattern of the school uniform’s skirt. Proceeds from the sales will go to the various Assumption Mission Schools in the Philippines. St. Scholastica's College Manila High School Batch 1986 launched the Scholastica's College Watch by Swatch in celebration of their Jubilarian year. The silicone strap features the symbols of the Scholastican ideals "Ora et Labora" (prayer and work) and "Pax" (peace) in the school's colors blue and white. Proceeds will go to the St. Scholastica Research and Development Foundation (SSRDF) for the Corazon C. Aquino Professorial and Scholarship Fund. For the Immaculate Conception Academy (ICA) Watch by Swatch, the school’s Batch of 1989 spearheaded the commemorative edition in time for ICA’s 75th founding anniversary as the first Catholic School for Chinese-Filipinos in the Philippines. Also called the Chica Watch, the product features a watch face with playful-looking numerals, a white silicone strap printed with chica artwork of little and big sisters, and a loop printed with the text "ICAN." Proceeds will go to the beneficiaries of the ICA Scholarship Foundation. Kim Chiu personally chosen by Jackie Chan for his next film?